This is one charming and attractive plant that has been in and out of our garden since 2004! It’s like a love and hate relationship with us. When it dies unexpectedly, it is removed and forgotten! But, absence makes hearts grow fonder – when we chance on it at the nurseries, we’ll fall in love with it again and bring it home to try another love affair! 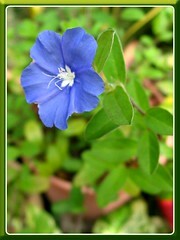 Its dazzling blue flowers and beautifully contrasting white throats are too marvelous to resist! 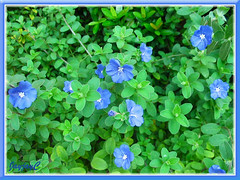 Common Name: Evolvulus, Blue Daze, Hawaiian Blue Eyes (though the latter two are also names of E. glomeratus cultivars), Brazilian Dwarf Morning-Glory. Plant type: An evergreen herbaceous perennial, native to Brazil and Paraguay. Light: Bright light or full sun; Can tolerate partial shade to shade but will result in less flowers. Moisture: Performs well with regular watering and do allow soil to dry out between waterings. Over watering can kill it. It can tolerate arid and dry conditions, once established. Soil: Well-drained poor sandy or loamy soil. Propagation: Easily propagated from softwood stem cuttings. Just cut a sprig and stick it into moist soil. Or, if grown on the ground, its stems tend to take root where they touch the ground, so separate the rooted stems from the parent plant with the pointed tip of a spade and plant as desired. Another easy way is by dividing its root and stem mass. Evolvulus can also be propagated from seeds. Features: Evolvulus glomeratus is a tropical evergreen subshrub perennial that is grown more as an annual in cold regions. It is low-growing, reaching a height of 0.75-1.5 ft tall and a sprawling mound of 2-3 ft. wide with fabulous grey-green foliage. Downy leaves are egg-shaped (0.5 x 1 in) and alternate, held on brown woody stems that are kind of rough and hairy. 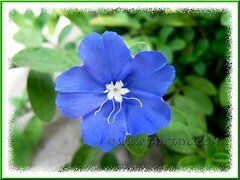 Beautiful real blue 5-petaled starry flowers (1 in wide) with bright white centers are borne singly at leaf axils near terminal stems. Evolvulus flowers abundantly though each flower is short-lived and lasts for only a day. And, flowers open in the morning and close in the afternoon or downcast days, similar to the Portulaca grandiflora. Grown on ground, it sprawls and on hanging baskets it cascades over. 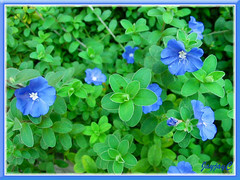 Usage: Blue Daze will be most ideal as a groundcover (cover plant) or a bedding and border plant. An excellent plant in hanging baskets, containers or planter boxes, placed at balconies, window sills, or raised on a pedestal. Most suitable in rock gardens or trailing over stone walls and trellis. And, suited too for coastal or seaside gardens as it is highly tolerant of salt. 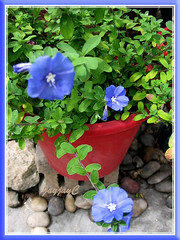 Care: Evolvulus is quite a low maintenance plant. As long as it receives sufficient bright light or sunshine, frequent watering and a small dose of fertilizer occasionally, Blue Daze will dazzle you with its prolific blooming and luscious grey-green foliage. Repeat pinching of stems is encouraged to produce a bushy shrub and abundant flowering. Plants are susceptible to root rot if waterlogged or overwatered, otherwise they are least bothered by pests and diseases! For temperate zones: Hardiness – USDA Zone 8-11. In regions that get frost, blue daze is best grown as an annual or in container that can be overwinter inside. More information here that also contains comments and opinions of other gardeners. Blue Daze seems to shine better if ground-grown. Early this year, we had our potted plants transferred to the ground, as frontal groundcovers for the inner garden bed, and they just love it as seen in the images below. 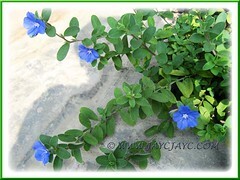 Some tip cuttings as well as stem cuttings were push into the soil at the same time, and in a short period they have carpeted the ground with their lovely foliage and sweet faces in dazzling blue. How wonderful! Cuphea hyssopifolia, a non-stop bloomer! Torenia fournieri has many fancy faces! Grow Chlorophytum comosum (Spider Plant) to purify the air! Where can you buy blue daze seed? I planted the blue daze as an after thought in my front garden and was so surprised to find how beautiful, hardy and large it grew. Full sun and moderate watering. I just bought 9 plants today. So pretty and easy. Indeed, Val! They’re so easy to propagate too! Enjoy your beauties! Do you know if this plant is safe to grow around dogs? Thanks. Sorry Nancy…. we’re clueless on this matter. Best to google-search for an answer to your question. Will deer eat the Blue Daze Plant?